The priceless wireless logs, or Proces-Verbals, for the Titanic disaster are held at the Bodleian Library at the University of Oxford, England, as part of the archive of material donated by the Marconi company. Most of the logs, or "PVs" comprise the well-known vessels; the Mount Temple, the Olympic, the Frankfurt and other anonymous ships and land stations, utilising both the Marconi, De Forest and Telefunken wireless telegraphy system. While fascinating, these lesser known stations don't add anything to our knowledge of the disaster. 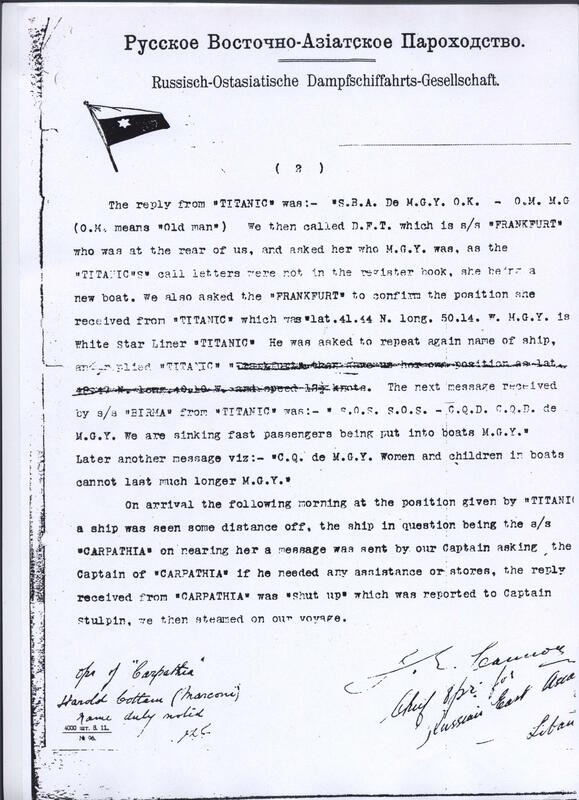 Of the vessels intimately involved in disaster operations, three of the PVs are of note: the Carpathia's log simply notes "Carpathia rescue of Titanic � Apparently too busy to keep PV going," in a hand distinctly dissimilar to Cottam's normal handwriting. The Californian's log has been missing for at least five decades, as noted by Leslie Reade in "The Ship That Stood Still" and in his copious correspondence with Walter Lord :there is a (empty) folder reserved for this PV in the Marconi collection but the document has long since vanished. The other PV of note is not in the Marconi collection either. 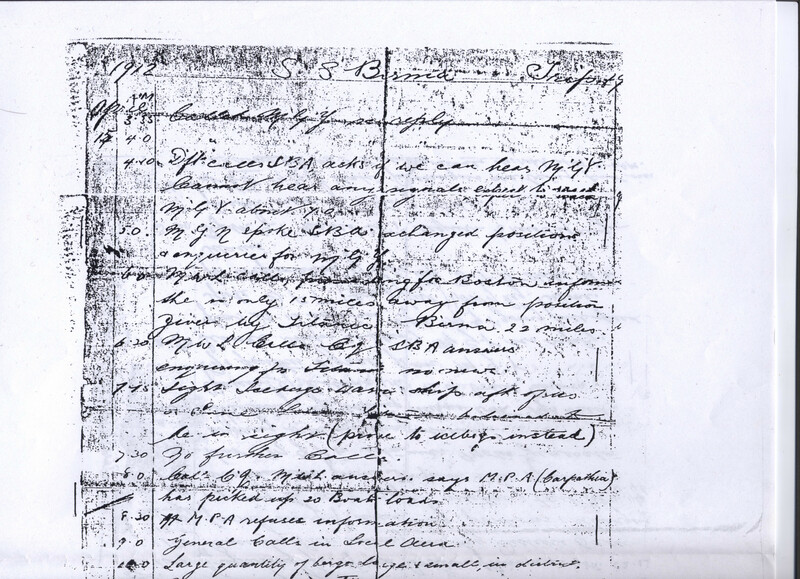 It is from the Russian East Asiatic ship, the SS Birma. The log briefly resurfaced in July 1990 when the Daily Telegraph newspaper mentioned that the current owner intended to put the PV and an accompanying report written by the Birma's wireless operator Joseph Cannon up for auction. But now, it has reappeared and thanks to the generosity of a benefactor, who requests anonymity, a transcript is available. The PV is written in a fine pen, initially thought by this author to be a pencil, and is difficult to read in places. There are occasions, for instance, where the capital letter "G looks like an "O" in some locations. The first thing that is immediately obvious is that, unique amongst all the PVs, this one is not written relative to New York Time (NYT), but in local time aboard the ship. 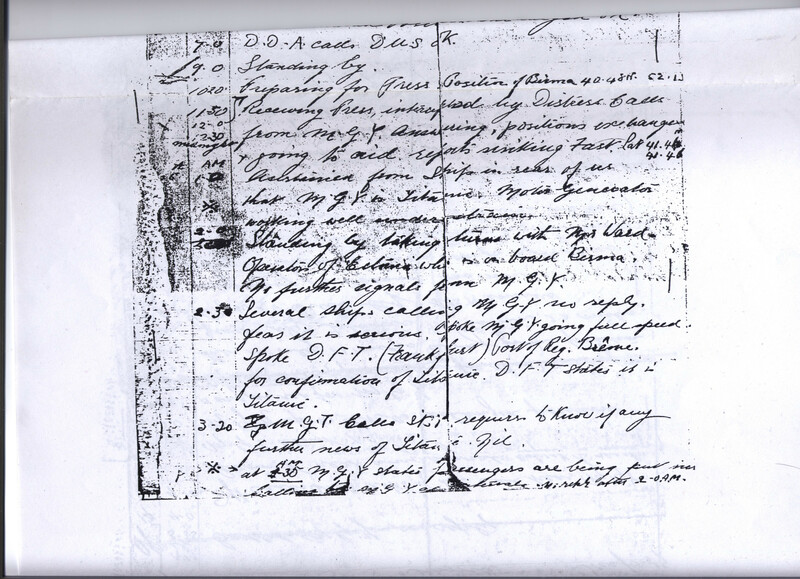 This paper will attempt to ascertain where in the Titanic chronology this unearthed PV can be fixed. As will be evident, this is not a trivial task. 10.20 pm: Preparing for Press. Position of Birma 40 48 N, 52 13 W.
01.00 am: Assistanced [Ascertained - SH] from ships in rear of us that MGY is Titanic. Motor Generator working well under strain. 01.30 am: At 1.30 am MGM [sic? MGY] states passengers are being put in boats. Calling MGY at intervals. No reply after 2-0 a.m.
2.30 am: Several ships calling MGY, no reply. Fear it is serious. Spoke MGY [? - MGN? ], going full speed. Spoke DFT port of reg Bremen for confirmation of Titanic. DFT states it is Titanic. 03.20 am: MGT [sic - MGN? SH ] calls SBA requires to know if any further news of Titanic. Nil. 3.35 am: Called MGY. no reply. 4.0 " " " "
4.0 am [4.10 - SH]: DFT calls SBA, asks if we can hear MGY. Cannot hear any signals. Expect to reach MGY about 7.00. 06.00 am: MWL calls, proceeding from Boston, informs she is only 15 miles away from position given by Titanic. Birma 22 miles. 06.30 am: MWL calls CQ. SBA answers inquiring for Titanic. No news. 07.30 am: No further calls. 08.00 am: Call CQ. MWL answers, says MPA has picked up 20 boat loads. 08.30 am: MPA refused information. 10.00 am: Large quantity of bergs large and small in district. 10.30 am: No further sigs re Titanic. 11.00 am: Call MPA who has picked up 20 boats. Ask if they need assistance or stores. Told to shut up and stand by. 11.30 am: MPA calls Baltic. Baltic sigs very faint. 12.00 pm: Standing by. nil. 02.30 pm: Spoke DFT, exchanged positions, asks us what she should do, to stand by or go on: Told her it was no use, we saw nothing and understood MPA had picked up all possible to be seen. 3.0	pm: Spoke MON [MGN ?]. Asks if any news. Nil. OK.
4.0 pm: Spoke DFT for any further news. With the basis of the PV established, let us start our analysis. The narrative starts, for our sakes, just before the Titanic's CQD is received. Harold Cottam of the Carpathia told Senator Smith's investigation that "[he] was receiving the press communications from Cape Cod" just before he got in touch with the Titanic. He confirmed this detail in a 1956 BBC interview. 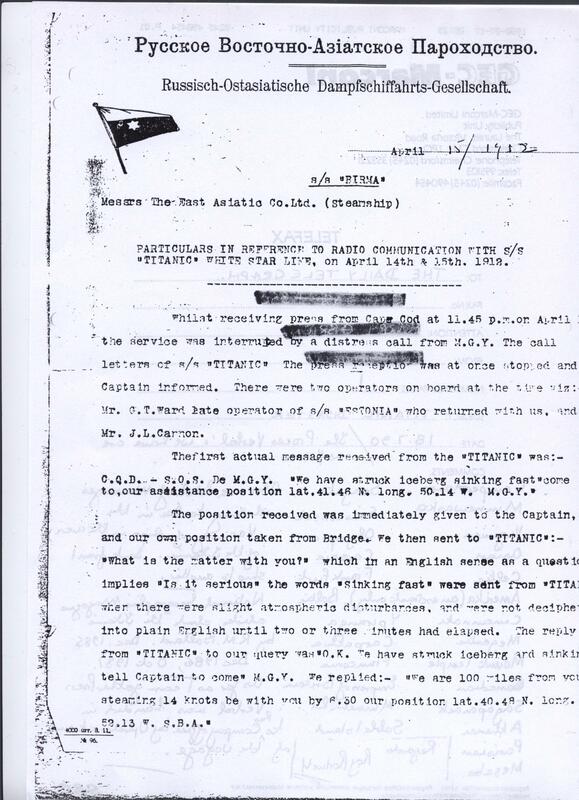 This is nice correlation with the Birma's log that he was receiving press when the CQD broke in, and the revised Titanic position of 41 46 N 50 14 W tells us that this message was received between 10.28 and 10.35 pm (New York Time) if Lord Mersey's collation of wireless messages in his report is correct. This implies a time difference between 1 hour 22 and 1 hour 15 minutes between the Birma and New York. The message timed at 1.30 stating that the Titanic passengers were "being put in boats" has an immediate parallel with the 11.40pm (New York Time) dispatch to the Olympic to "Tell [your] captain we are putting the passengers off in small boats." This comes from MGN, the Virginian, which had heard the same message at 11.35pm. This puts the time difference with New York closer to two hours. This is also confirmed by the entry "2.30 am: ...Spoke DFT port of reg Bremen for confirmation of Titanic. DFT states it is Titanic." DFT is the North German Line steamer Frankfurt. The Mount Temple overheard this conversation and notes in her own PV, "3.05. Birma and Frankfurt working," a fact also noted 15 minutes later. A New York time difference of about 1 hour 35 to 1 hour 50 minutes is apparent from this. Of course, there may be a few minutes difference in noting times as operators seemed to round up or down to the nearest 5 minutes. Then there is a highly contentious entry: "06.00 am: MWL calls, proceeding from Boston, informs she is only 15 miles away from position given by Titanic. Birma 22 miles". 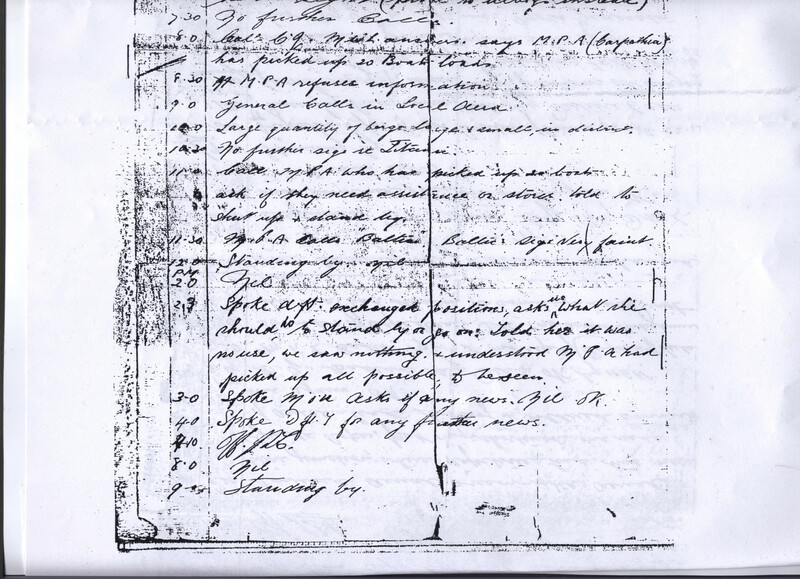 MWL is the infamous Californian, and a lot of nonsense has been written about this "crucial find" most notably by ignoramus Senan Molony in his obsessive attempt to exonerate Captain Lord of this notorious vessel. Further conversations with MWL ensue at 6.30am Birma time. The Mount Temple heard one of these calls, which she timed as being 4.25 in New York, implying a time difference of something like 1 hour 35 or 2 hours 5 minutes depending on just which set of conversations was overheard. The 2 hours 5 minute value does not seem very likely. We do not know exactly when the Birma altered her clocks on April 14th, but since she was to the west of the Titanic for that day, her time difference would have been, at the very least, equated to her initial longitude of 52 13 � and probably even further west than this. And, at this longitude, the time difference would be 1 � hours. An even more westward longitude would mean a lower time difference. Even at the SOS longitude of 50 14 W, the time difference would only be 1 hour 39 minutes. Why adopt an even greater time difference when the Birma was nowhere near longitudes east of this during her rescue attempt? Incidentally, the PV for April 13th and 14th for the Birma do not indicate any clocks being changed. Perhaps there is another way to analyse this. The Birma's initial position was some 107 miles to the south west of the Titanic. She expected to get to the Titanic's position at about 7.00am on the morning of April 15th according to Joseph Cannon. If the Birma progressed immediately to the disaster site after receiving the initial CQD, this would amount to 7 hours of steaming, at a speed of 15.3 knots. This seems excessively high for a ship whose top rated speed was 13 knots. We must therefore neglect the anticipated arrival time of 7am as a mistaken estimate. If we take the 13 knot speed, then the time taken to travel 85 miles (distance travelled up until 6.00am) would be 6.5 hours. For a hypothetical midnight start, this would equal about 6.30am on the Birma, and this was mentioned on a message sent at 6.00am. What happened to the missing 30 minutes? Were the clocks retarded? If so, why? Retarded clocks apply to westward travel, and not eastward travel as the Birma was doing at the time. Was the Birma travelling faster than she thought, reducing her transit time? Unlikely. Her engines were old and it would appear to be a mechanical impossibility to drive them faster than their design speeds. One need only examine the debate regarding the Carpathia's mythical 17 � knot dash to reach the lifeboats to convince themselves that such an over speed situation is unlikely. However, did her crew think the Birma was travelling faster than she was? Her wireless messages indicate that the crew thought a speed of 14 knots was attained. If so, this would make a transit time of just over 6 hours, in keeping with the 6am time on the Birma. So, now we have a ship whose local time relative to New York can be variously calculated as being 1 hour 15, 1 hour 22, 1 hour 35, 1 hour 50 or 2 hours 5 minutes ahead of NYT. This can place the Californian's 6.00am "15 mile" message as being anything between 3:55am and 4:45am in New York, or between 5:50am and 6.40am on the Californian. Who knows which one of these is correct? The Birma's progress across the Atlantic favours a lower time difference, but proponents of Captain Lord would say that the 6.40am time would be the most fitting as "15 miles" refers to the Californian's alleged overnight distance to the wreck site of 19 miles, less 4 miles of cruising through the ice, to emerge at 6.30. But this means a 2 hour and 5 minute time difference with NYT which is unlikely, as demonstrated above. If the Californian did travel the 'missing' 4 miles between 6 and 6.30am, then she was travelling at about 8 knots...hardly the "crawling" speed that her officers testified to in London. A time difference of 1 1/2 hours or less means a time closer to 6.00am aboard Captain Lord's sleepy vessel when the Californian had just started her crawl through the ice and a closer overnight estimated distance between the Californian and the Titanic by Lord's apologists. If the "15 miles" distance can be timed to 6.00am on the Californian, then where did Lord's 17, and later, 19 mile distance come from? And the "15 miles" is not the panacea that is claimed for it either for another reason: the overnight location of the Californian was only an estimate. The Titanic's SOS location was an estimate. The distance between two estimates can only ever be an estimate of the true distance. "15 miles" could refer to anything. And even if it was right, and the Californian was indeed this distance from the wreck, then by the time the Titanic succumbed to the strength of the iceberg, the Californian would have drifted for well over an hour southward, that is, towards the White Star giant and hence reducing the distance even more! It is astonishing that this simple exercise of logic has not been applied sooner. There are other problems when placing these messages in a chronology of Titanic messages. The SS Baltic has a New York Time of 2.15am for the Birma's message in which she declares being 55 miles off from the site of the casualty. A 55 mile distance (meaning 52 miles travelled) points to the Birma having been underway for 4 to 4 1/4 hours, depending on whether one uses a 13 or 14 knot estimate of speed which points to the Birma starting off at 10pm or 10.15pm (NYT) but the Birma only started her rush shortly after 11.50pm which gives us a time difference (again!) of something just over 1 hour 50 minutes or 1 hour 35 minutes. One cannot help but feel that the Birma's clocks were adjusted that night from approximately 1 hour 20 minutes ahead of New York to something like 1 hour 45 minutes, putting her time and the Californian's very close. 1 hour 45 equates to 48 degrees 45 minutes W which puts her extremely close (within a few miles) of where she would have been at noon on April 15th 1912 if she had maintained her original course and a conjectured speed of 13 knots. The Titanic herself utilised this practise of adjusting her clocks around midnight so that local time at noon the next day would be correct. The following diagram illustrates this. The Birma's wireless messages, relative to other messages received at various times relative to New York. The above hypothesis works both ways; can we predict the longitude of the Birma at noon on April 14th, and hence the New York Time difference? Yes, and when we do, we find it coincides very nicely with the receipt of the first CQD; about 1 hour and 20 minutes. The following diagram illustrates how the Birma's clocks behaved that night, relative to the shore station. To be blunt, the Birma's PV is of little historical significance; it tells us little that was not already known, but falls into the category of being a nice historical curiosity. The fact that Joseph Cannon was keeping a variable, local ships time make it very hard to fit the PV into other events. And the mention of the Californian and her 15 miles "exoneration" is a red herring. The tragedy is that it takes massive in-depth research and analysis to counter such bald claims.